The link to the spreadsheet is here. We saw lots and lots of cats. Which I love. And I mean, come on, this is the internet. Who knows what April will bring? My very best for April! My April pledge is a damn-near finished Canine Remains (4SS). I have another that is even-more-damn-near-finished, so expect at least 8SS this month. 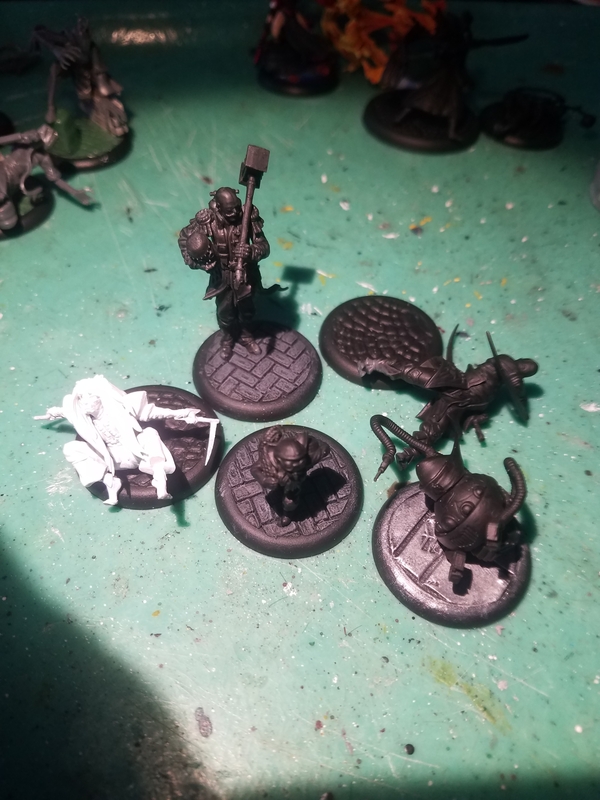 A Death Marshall (6SS), a Death Marshall Recruiter (7SS), an Executioner (9SS), a Guild Rifleman (5SS), and the Wendigo (3SS). 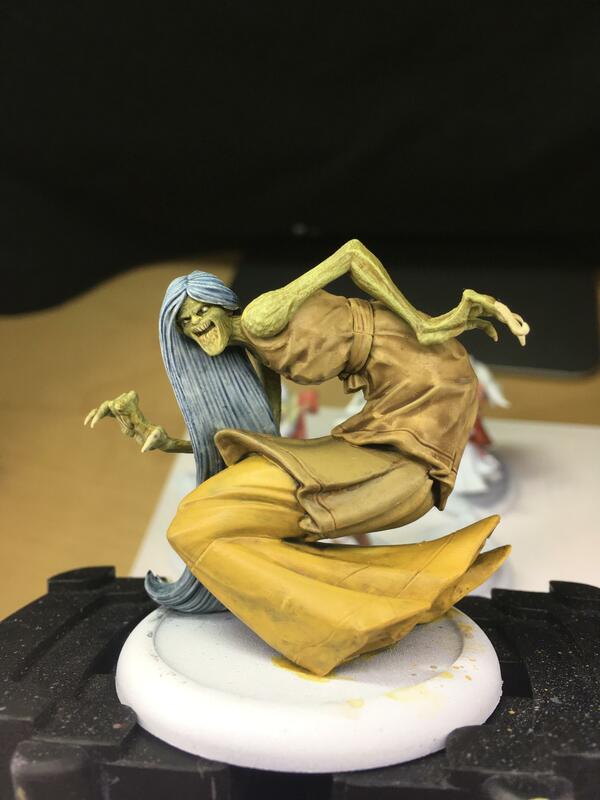 The Executioner (awful, potato-quality photo) is actually near finished, and being used as another painting-challenge contestant. Expect him to be completed as well. The recruiter will be a gender-conversion Green Stuff effort. My Green Stuff skills are ... not great. Have a fantastic April, and keep putting pigment to plastic! I will pledge a Malifaux Rat again. 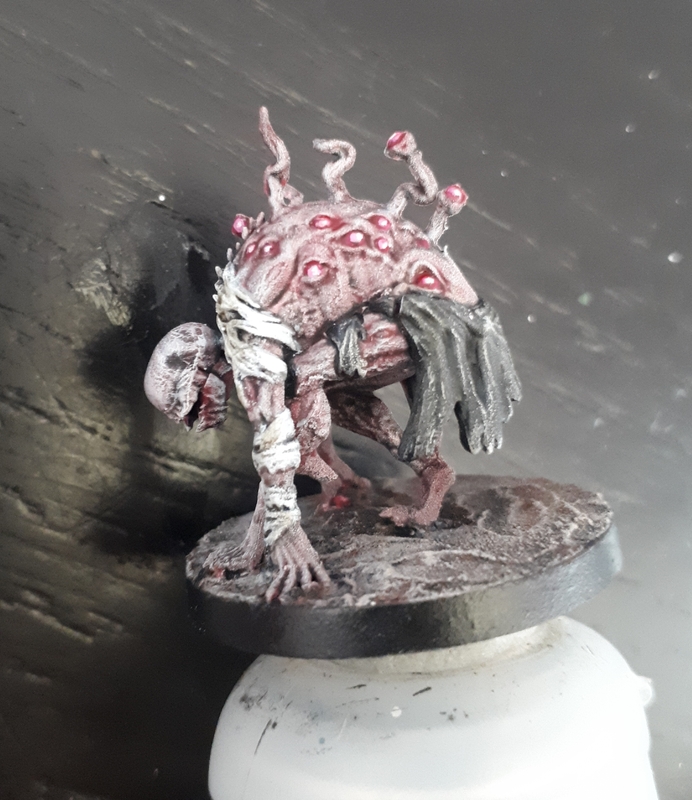 The second Apostle of Blight. on Hamelin already mounted to a cork. I left behind March with few new small scenics to add to my collection, with the appearence of a strange cat from the deep space and with a lot to projects to go after. 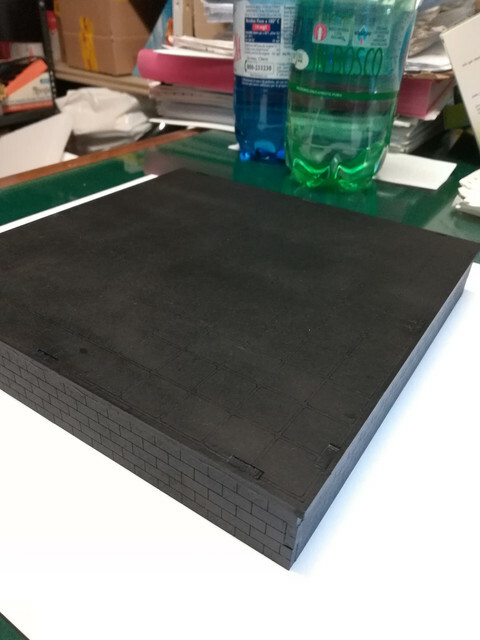 These basements fron TTcombat Streets of Venice are very useful to built some urban play-table crossed by channels and rivers. 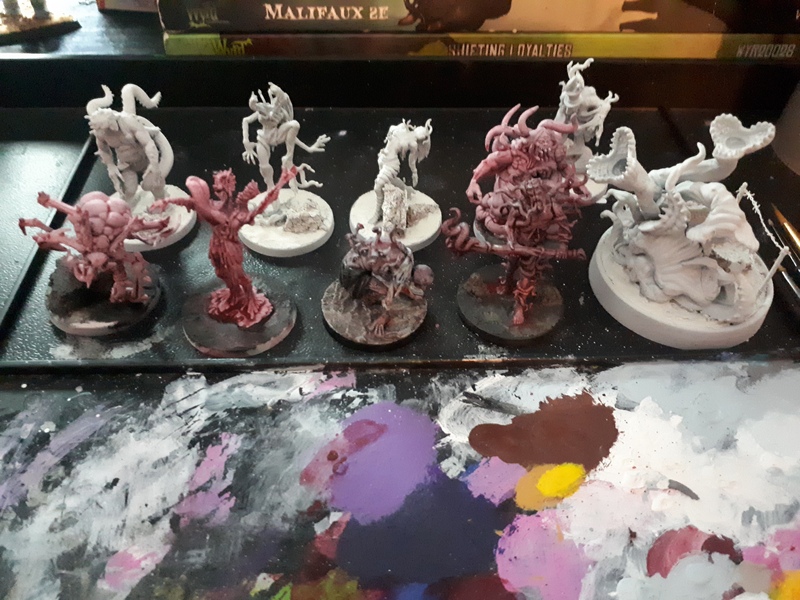 I have to paint many of them and they come in different sizes: from 10cm to 30 cm. Let's say each of them, but it's dimension, is worth 5 SS? So I could extablish my record score in montly pledge free competition this month. I should get time to work to completion at least 2 of them. She spends a lot of time looking the sky..... I realized her spaceship is irreparably damaged. So I decided to assist her and many of my efforts will go after the construction and painting of my DroopFleet Commander Fleet. It's also possible that the cat is indeed an alien spy sent to study our civilization in preparation for a massive alien invasion. Good reason to increase my effort in the building of my space fleet. I'm waiting for some componets from Scibor, Wyrd and TTCombat but their delivery time is not predictable. I could add some extra to my pledge getting them home in time. I wish you all an happy month of painting. Pledging Tengu for 4ss. Going to practice black cloth. Or "black". No idea about rest of the paint scheme yet. 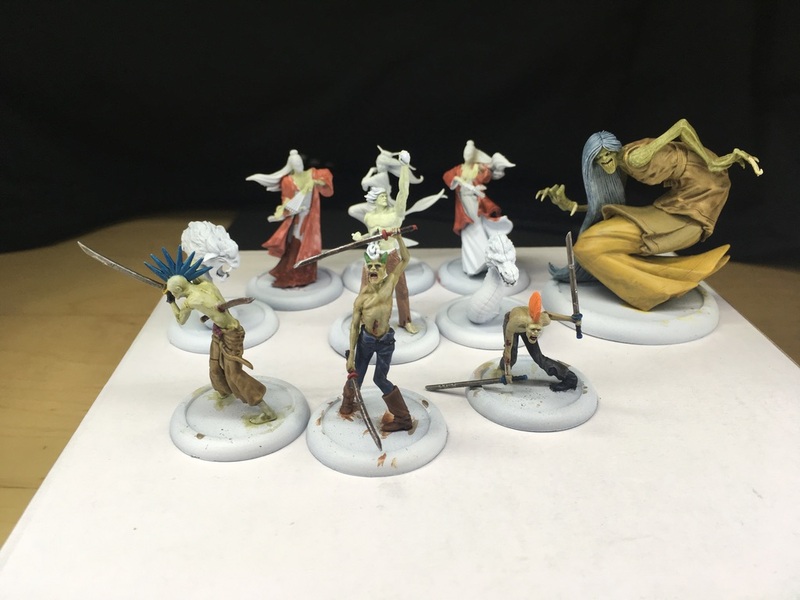 @Viruk your Marcus crew is looking great so far. @PetitDalek I own the Bunny Rider but I did not put hands on it yet. I must say that mini is very cute. I'll wait with impatience to see it painted from you. Do you guys know a tutorial on how to do the popular yellow-black orkish 40k style I could apply on this robot? You see what I mean? 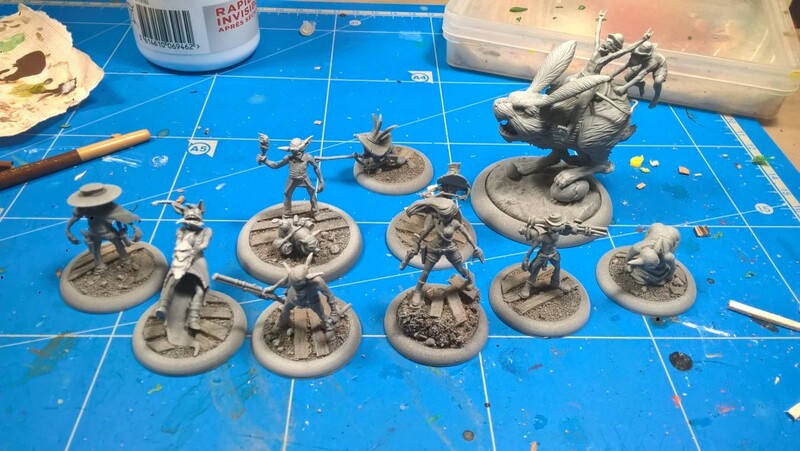 Lots going on this month: getting a few Arcanists ready for an end of beta M3E tourney next weekend, namely new "basing" for Colette's Doves in the form of her Avatar models, Mouse, and a Medi-Bot, for a total of 11ss (or 21ss if I manage to fit The Captain in as a stretch goal). Then, the real fun begins: after that tourney I'll be putting my Arcanists aside for a minute and focusing on Thunders as a way to better shift gears back from beta testing to playing for fun, and trying something new. 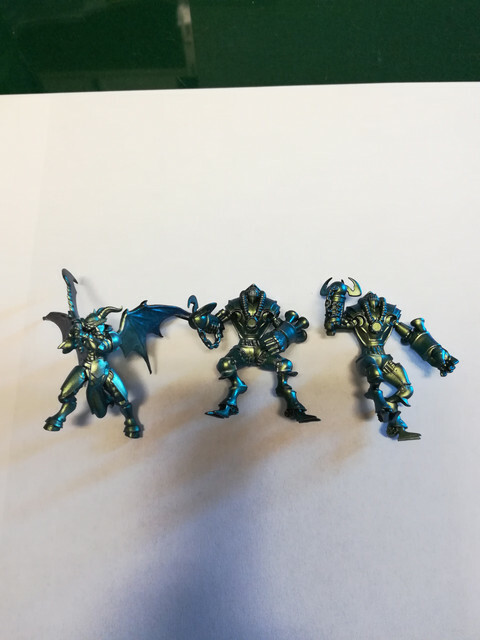 As many of you have seen with my Justice League Arcanists, I like to theme things, so I've developed a bit of an art project. I'll be making my Misaki crew into team RWBY from Rooster Teeth's show of the same name. Misaki herself is painted, I'll just be modifying her weapon a bit, and Shang is getting re-done to be Zwei fully. The rest of the core will be Minako as Yang, Crime Boss as Weiss, a Torakage as Blake, and Katashiro as Blake's semblance shadows. 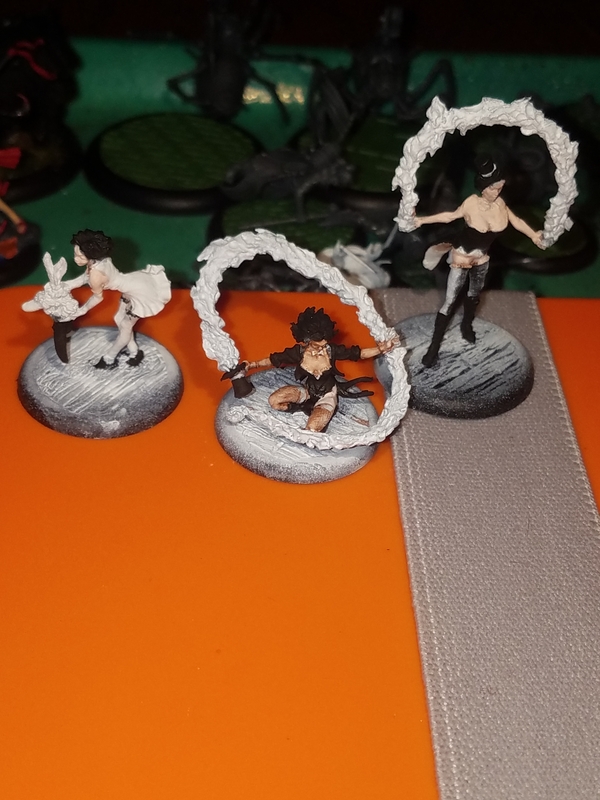 I'll be adding more in later months (like Ren as a Thunders Brother) but want to get the 4 of them done to start off. Wish me luck! Thanks, now I know it's old Colette Crew, metal version I guess! 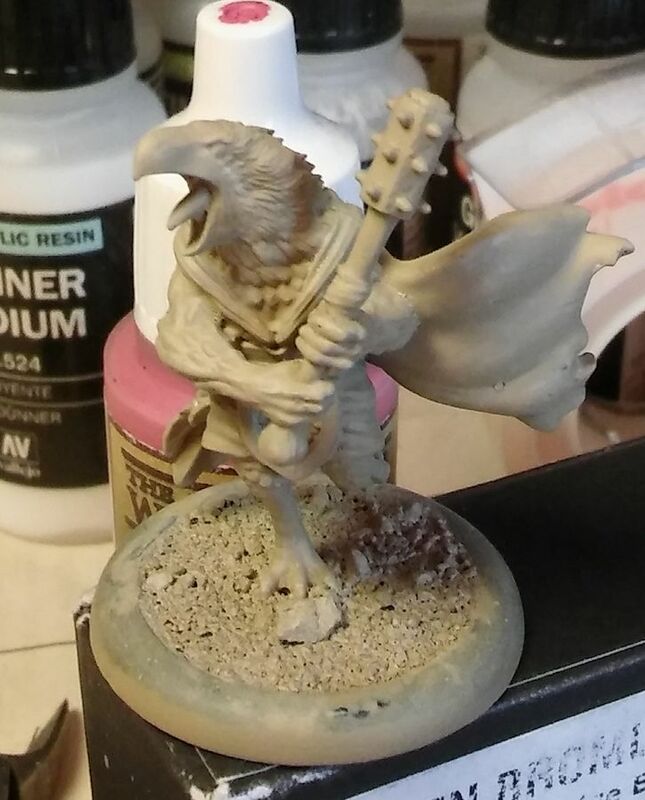 Sorry I'm not familiar with WH 40,000...... That mini was one of the first I painted: bare metal washed with a matt black and few details evidenced with some spots of a different shade. I believe you're referring to "hazard stripes". Plenty of tutorials for those, as they're a common enough feature in the 40k setting. I'd start with opaque paints to block in the pattern first. Those three are actually the metal Colette Avatar from 1E. Instead of going to a 50mm like most of the others, she became three 30mm, two of which were essentially illusions. 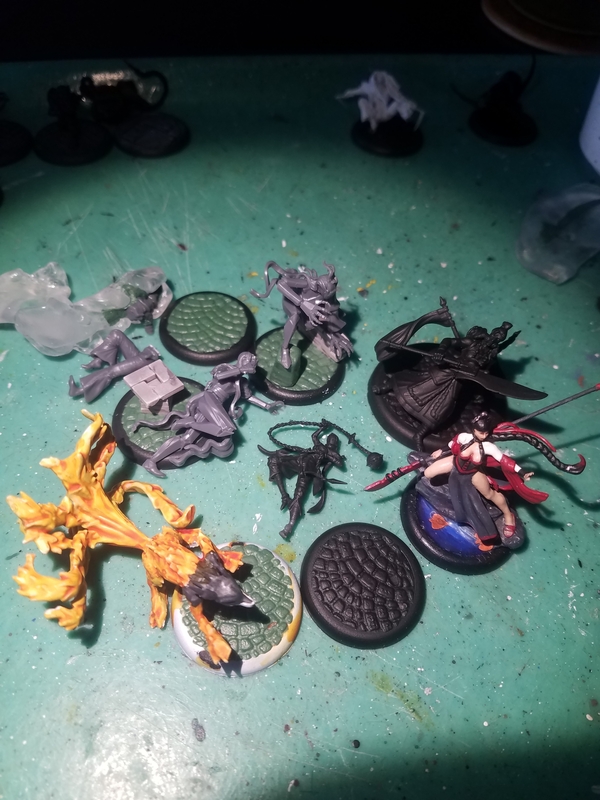 A friend got these for me a while back and I'm making them the basing for Colette's dove so they'll be in every game with her and will really give a sense of a whole magician's act/theater troupe even if I end up using a few versatile models. After three straight months of painting TOS, I'm ready for something else. 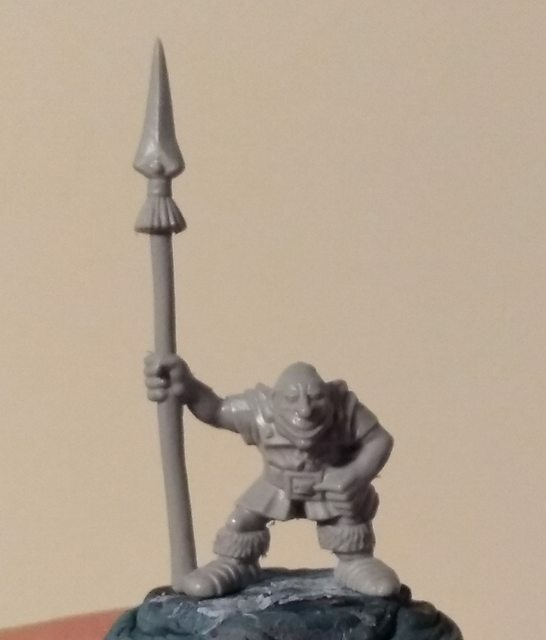 My pledge for April is my scratch built Som'er Teeth Jones proxy. I never really liked the noseless, Roswell green aesthetic for Gremlins so I gave him more pronounced features, pretty happy with how it turned out. Since the whole crew will be scratch built I'm going for a bit if an alt look. The idea is that they're more of an undiscovered tribe than hillbillies. Figured the more basic technology is easier to sculpt and if I want to use a bunch of random bits I can say it's some sort of cargo cult thing to explain any mismatched parts. I'm planning a fireteam of karkinoi for 21ss. 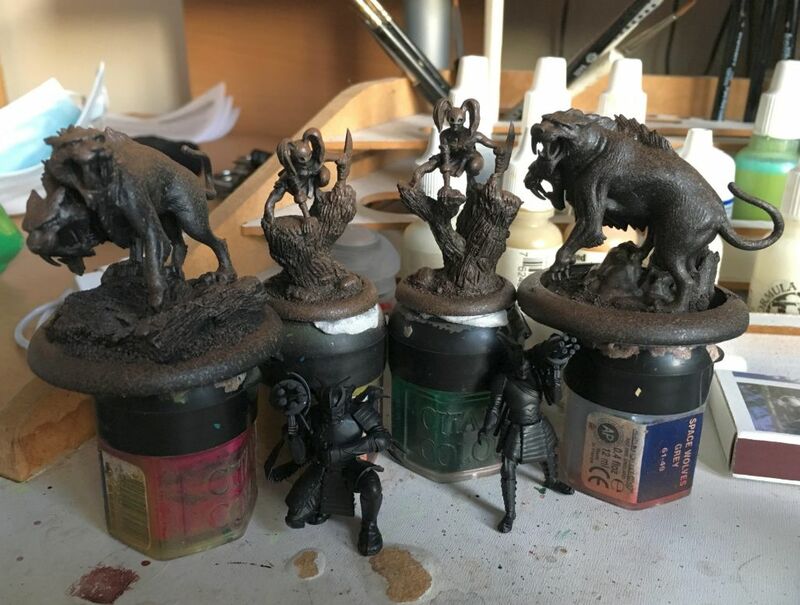 I was able to try to put some sand on the bases this month and so April I should be able to paint and have less basing work to do. 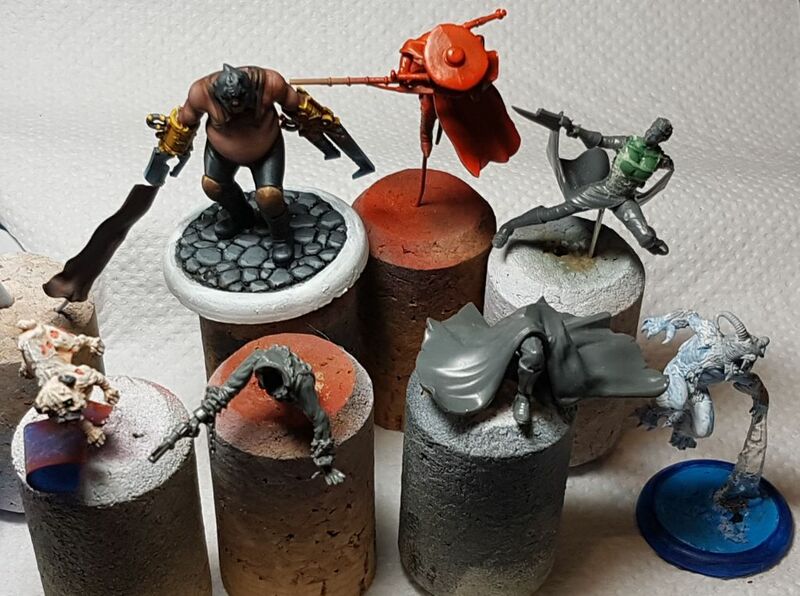 For April I'll try to finish the Ortega family adding the Abuela plus Nino Ortega, and then start with the Lucius crew I'd test for M3E, so I'll go for Lucius, the Scribe and Ryle.